Copenhagen, Denmark – 30 January 2019. The management of Copenhagen-based KABS acknowledges that there is a need to digitise parts of the treatment to both ease the burden of difficult and time consuming data collection and to offer people better, more proactive and personalised treatment. 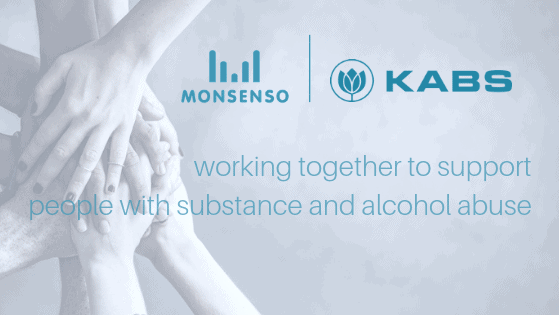 Therefore, Monsenso and KABS have joined forces to provide more effective, user-centered treatment by using mobile health technology to better support people struggling with addiction. “Knowing about the individual’s well-being is crucial for setting up the best possible treatment. Gathering data solely through face-to-face interviews might often be inaccurate and time consuming, and the data may be biased by the individuals’ well-being and motivations during each interview session. We have decided to use the Monsenso solution, to improve our data collection using a digital platform for individuals to do self-assessments. By knowing more about the individuals, we are able to provide better treatment, while it is also an attempt to reach and attract the young people, who are in need of help.” says Rasmus Axelsson, Head of KABS. The Monsenso solution will be implemented in a pilot project in the unit KABS Stjernevang with 10 therapists using the system. The pilot project includes both alcohol and substance abuse, as well as cases of comorbidity, where individuals also suffer from a mental illness. The mHealth solution combines data collection through self-assessments and questionnaires to provide the therapists with a detailed longitudinal view of the person’s wellbeing. The Monsenso solution will be customised to complement KABS’ services in order to provide therapists with an overview of the individual’s illness progression, their symptoms and any medication compliance. The solution also notifies therapists and users when they display any illness related warning signs, enabling them to monitor each user remotely and to intervene at an early stage. “We are looking forward to be working with KABS and the experienced team of therapists. We understand the very close relationship between mental health and addiction and are working closely with Rasmus and his Team to enhance the way alcohol and substance abuse treatment is delivered.” said Thomas Lethenborg, CEO of Monsenso. KABS is part of Glostrup Municipality and is one of the largest addiction treatment centers in Denmark, and has provided medical treatment and therapy for substance and alcohol abuse for many years. The organisation currently provides medical and social treatment for substance and alcohol abuse to approximately 800 citizens from 46 municipalities. Monsenso is an innovative technology company offering a mHealth solution that optimises the treatment of mental disorders. The smartphone-based solution gives a detailed overview of an individual’s mental health through the collection of outcome, adherence and behavioural data, and it connects individuals, carers and health care providers enabling personalised treatment, remote care and early intervention.